Early Lactating Mare Once you finally have your new ‘super star’ hit the ground your mares’ nutritional requirements go into over drive. Your newborn foal will be growing at 1-2kg per day. The mare will be producing up to 20 litres of milk per day to ensure the foal is receiving the right amount of nutrients. As a result your mares’ energy requirement will be nearly double (175%), protein will be (220%), Calcium and Phosphorous increase to (270-280%). It is nearly impossible for your mare to actually consume this amount of nutrients so she will have to draw on body reserves to ensure she maintains milk production for the foal. This is why it is important to make sure you keep your mare in a good to moderately fleshy (CS3.5-4) condition score during the last trimester of pregnancy. During this time you may wish to re-join your mare. If she is in good condition and has a well-balanced diet the chances of a successful conception on first return will be greatly increased. 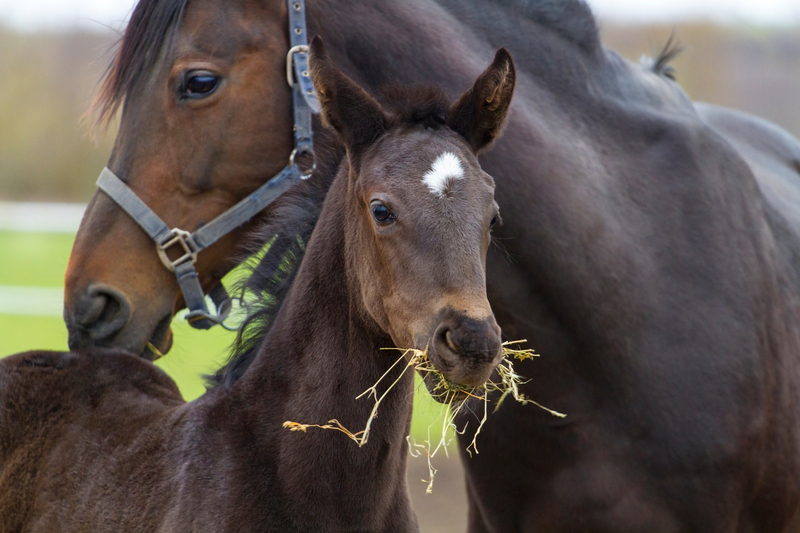 Studies have shown incorporating certain nutrients such as selenium have improved conception rates in mares and fertility counts and sperm conformation in stallions. Late Lactating Mare For mares in late lactation which is generally termed from 3 months after foaling until weaning the mare will still have increased nutrient requirements compared with your ‘dry mares’. The mares’ energy requirements will be 150% of a dry mares requirements. Protein will be approximately 160%, so as will Calcium and Phosphorous. As you can see the nutrient requirements for Lactating and Dry mares are quite different. As a management tool separating your wet and dry mares will enable you to ensure that each mare and foal are fed to their requirements and not an average of both. Correct nutrition of your pregnant mares and foals is an investment into the future of your up and coming equine athletes. Consulting your equine nutritionist to develop a feeding program for your whole stud is extremely important to ensure all your horses’ nutritional requirements are met. They will take into consideration what type and categories of horses you have, what quality and quantity of pasture and roughage is available at various times of the year and what supplementation may be required to ensure all your horses nutrient requirements are met in the most economical and practical way.